Before The Date, a Norman Rockwell painting, appeared on the cover of The Saturday Evening Post published September 24, 1949. This is yet another timeless favorite of Rockwell collectors, a classic for all the ages. This painting was Rockwell's 261st overall out of 322 total paintings published on the cover of the Saturday Evening Post. Rockwell's career with the Post spanned 47 years, from his first cover illustration, Boy With Baby Carriage in 1916 to his last, Portrait of John F. Kennedy, in 1963. This was also the fourth cover for The Post in 1949. In 1949, there were five Norman Rockwell Saturday Evening Post covers published. I have seen pristine original copies of this magazine cover sell for big bucks on eBay. And to think it only cost ten cents originally! And it was mint condition then, too. The whereabouts of the original oil on canvas painting is unknown. on page 182 of Norman Rockwell, A Definitive Catalogue by Laurie Norton Moffatt. 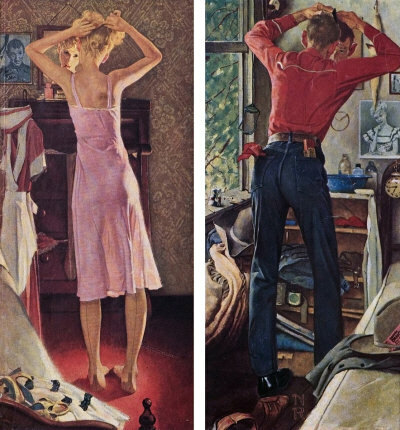 This classic Norman Rockwell painting shows a young man and a young lady getting ready for their date. This painting is actually two paintings as you can see. One painting is the young man and one is the young lady. On the left side of the painting we see the female part of the couple. She is in the process of pinning up her hair before she finishes dressing. We know this because she holds bobby pins in her mouth. I cannot tell if the garment she is wearing is her dress or her slip. If the garment is indeed her slip, then the painting is somewhat risque for 1958. It looks a lot like a slip. Also, what looks like a dress and shoes are resting on her bed at the bottom right corner of the painting. That dress on the bed also matches the dress she is wearing in the photo pinned on her beau's wall. Her stockings are 1950s stock with reinforced heels and the seam going up the back. She has already removed her waitress uniform and it is hanging waiting for its next use. If the event takes place on a Saturday night in 1958, then she would not be working on the next day. Businesses were not open on Sundays in 1958. Hanging on the wall, beside the mirror, is a picture of her sweetheart, the young man from the right half of the painting. All the little Rockwell touches of detail and authenticity are present in the painting of the background. The pattern of the wallpaper is rendered in great detail. On top of the young lady's dresser we can see her bottle of perfume and her other cosmetics. A spare stocking hangs out of one of the drawers of her dresser. Is she almost ready or will she be fashionably late? One of our readers, Justin Jay Carlson, relates that the model for this half of Before the Date is his grandmother, Beverly Carlson. On the right side of the painting, we get a glimpse into this young suitor's life. The young man, modeled by Fred Beilfus, is also working on his hair. Looking at the photograph in the young lady's room, we can that he wears his hair somewhat slicked down. He appears to be trying to tame his hair. It looks like he has a cow-lick on the back of his head. The details of his room are also impeccably rendered by Rockwell. There is even more detail in the young man's room. It looks cluttered compared to the young lady's. After all, it is a boy's room. The setting for the room was actually Fred's room in a bunkhouse at Snedden Ranch in Lockwood Valley in Ventura County, California. There is a pistol hanging next to his window. There is also a fly swatter hanging a little lower next to the window. There is a wash basin, soap and a towel on top of his shelves, along with cologne, after-shave and what looks like a bottle of mouthwash. A photograph of the object of his affection is pinned in the wall. Above the girl's picture, though, in classic Rockwell style, no doubt a subtle joke as well as characterization, hangs a picture of his horse. Tossed to the side, under the window, we can see a cowboy style hat and what looks like a fringed buckskin jacket. His dress hat and jacket are laying on the bed, ready for tonight. It looks like a pair of boots left in the floor directly behind his feet. Before The Date was only one of 322 Norman Rockwell Saturday Evening Post covers; Here is the list of Norman Rockwell Saturday Evening Post cover illustrations. He is wearing a red western style shirt and new looking blue jeans. His red handkerchief is hanging out of one of his back pockets. I am not sure what is hanging out of his other back pocket. His black dress shoes are polished to a deep shine. He is ready to meet and spend some time with his girl's parents.Remember, she is not ready yet, so he will have to wait for her to finish getting ready. His clock says the time is 6:45. His date is probably at 7PM, so it's time to be leaving.